Since the first years of the 20th century these two dwellings have been landmark shops in the village. Number eight is into its second century as a butcher’s and number six survived as a dairy to about 1970. The butcher’s shop front had been added to one of the residential properties before 1896 and that of the dairy to the other one soon afterwards. 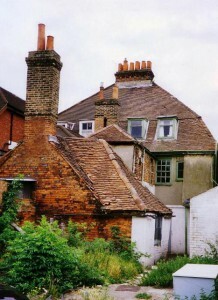 Previously the butcher’s house had been occupied by the Corden family of painters to Queen Victoria, who produced views of the church and the village in the 1870s. The whole property belonged to the Lords of the Manor (plus the corner top corner of the High Street beyond). The whole 6 and 8 house was rebuilt by the Manor in the second half of the eighteenth century to replace a derelict house whose tenant had thereby forfeited its ownership; the present house is known to have existed by 1781. 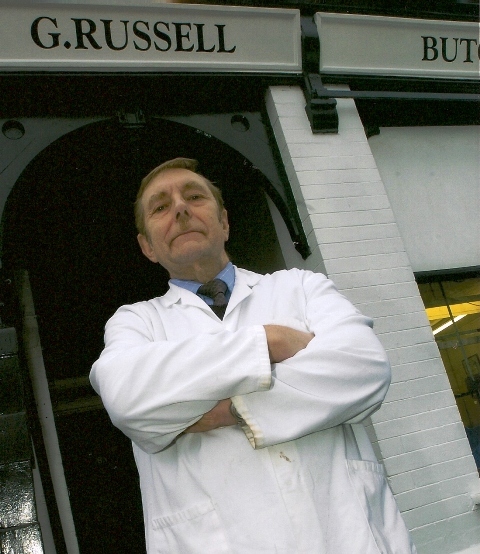 Graham Russell, whose first job was in this building, explained to the reporter: I’ve owned the place for the past thirty years and in that time I’ve managed to build up a group of loyal customers who have been with me since the start. Unfortunately it’s a dying trade and with the rent being so high and the economic situation in the last year, it’s become impossible to keep going. I’ve been able to fight off Tesco and the like, thanks to loyal customers, but it’s the sky-high rent and the landlords who sit back collecting their money regardless that has caught up with the business in the end. The shop will certainly be missed in the village as there is nowhere else that sells fresh meat as well as fruit and veg. The shop number six is fondly remembered in the village as Stevens’ Dairy and tea shop, supplied from their farm at Sumptermead at the end of Buccleuch Road. 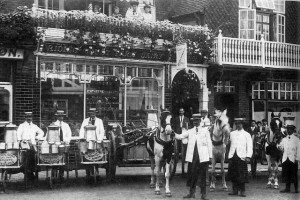 It first appears in Kelly’s street directories from the mid-1930s, while in the early 1900s it had been the dairy shop of the Kinross family, based at Riding Court and Ditton Park farms. The splendid shop front was built for the Kinross business in what had been the small front garden of the private residence ‘St Austins’ according to the 1896 sale plans (see below). 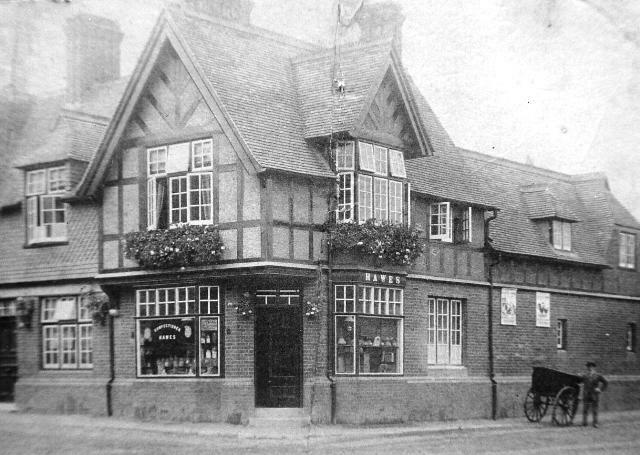 The forerunner of Datchet’s much-missed butcher’s shop was Copeland’s, between 1891 & 1896. The shop deeds show that the business passed to Checkley in 1908 and then (for £1000) to Augustus Harris in 1914. In 1937 it became Reeves & Son of Staines and now for nearly thirty years has been successfully run by Graham Russell. 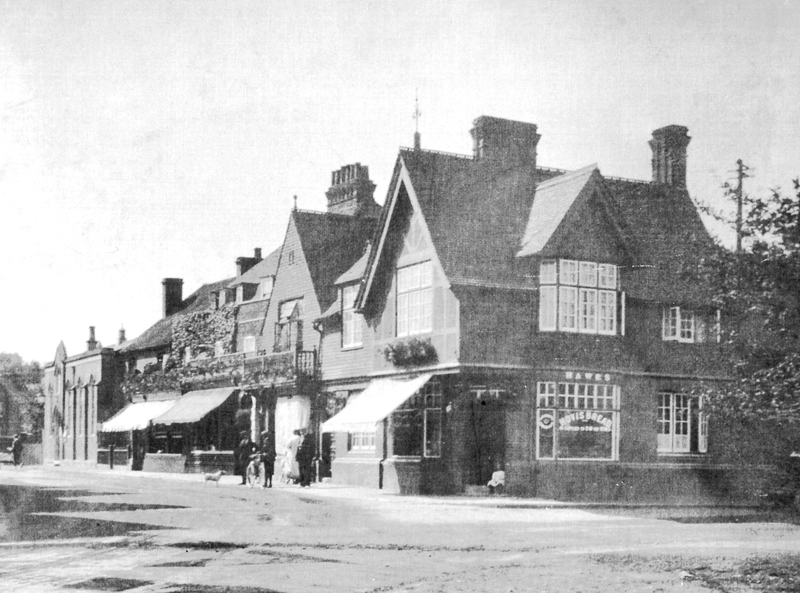 In 1896 the Montagu estate put all their Datchet village properties up for sale Not all actually sold at that time. 1st floor: Large Front Sitting Room, 2 Back Bedrooms, W.C.
Let to Mr Copeland, Butcher on 21 year lease at £35 p.a. The Corden family of painters consisted of William the elder (1797-1867) and William the younger (1819-1900), and his son Victor (1860-1939). 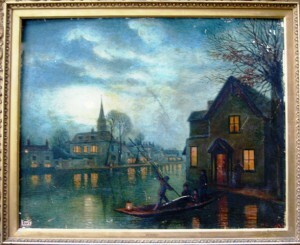 Thus the images of Datchet in the 1870s and the rebuilt church in 1864 must by William the younger and it is assumed those of the church in 1857 before rebuilding are also his. It is only William the younger who certainly lived here by the early 1850s. The first William was a painter of china in Derby and Nottingham who exhibited his designs (particularly portraits) at the Royal Academy. This led to commissions for Royal portraits, including the Queen. He also copied many portraits in her collection and was sent to Coburg by Prince Albert in 1844 to copy Saxe-Coburg pictures there. At the other house (number 6, St Austin’s) the family of Major Lewis Walsh lived for many years. 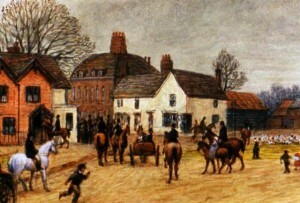 In the image on left, Corden has used artistic licence to move his own house into a clearer view than would actually have been possible. 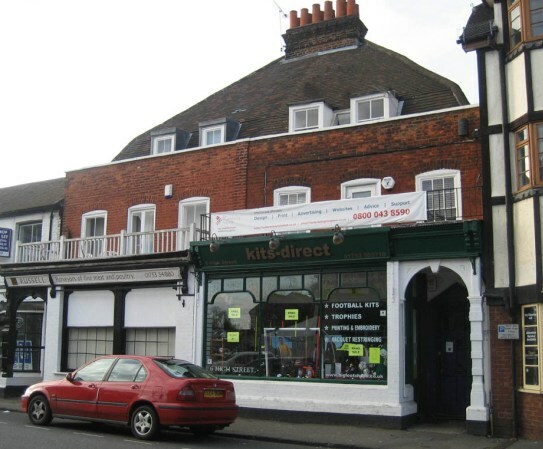 It shows the two dwellings without their later shop fronts and balconies. Adjacent on the corner is the ancient White Hart pub. On the right the flood scene could have been viewed from the top window of Corden’s house, again with a little artistic licence. The side of the Manor Hotel facing the Green in both these images had by then been rebuilt but the corner block was still a smaller whitewashed house like the White Hart opposite. The house is known to have been built by 1781 because in that year a Mr Gillson was recorded in a taxation list as the tenant of one of the houses, owned by the Duchess of Buccleuch. In 1783 the luxurious household effects of Mr Gillson were sold at auction on the premises. 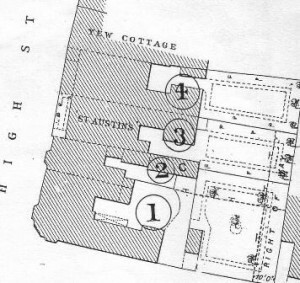 The sale catalogue describes the contents of each room and the sequence from top floor to kitchen exactly matches that of the 1896 sale description for the butcher’s shop, number eight.From top: back garret, red-papered chamber & chamber adjoining / staircase & passage / dining room, left hand parlour, right hand parlour / kitchen, bake & wash houses. This photo of the back of the house shows outbuildings which were probably the bakehouse and wash house of the auction catalogue. From the 1790s to 1820s the house number eight was occupied by the Buccleuch and Montagu family’s steward, Major Walter Scott (nothing to do with the author of that name). He would have been the Lord of the Manor’s eyes and ears, and during the Black Datchet riots of 1812 one of the ringleaders was caught and brought into ‘Major Scott’s house in the village’. Here he apparently became contrite and made a promise to behave, though he did not keep it for very long. 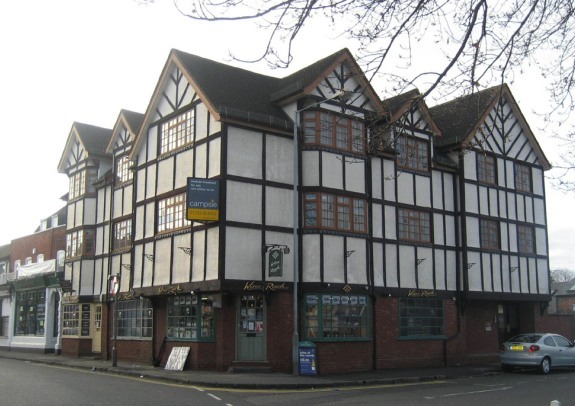 The Wine Rack, a late 20th century rebuild of the 1880s corner bakery, retains many features of the previous shop: the raised corner entrance (which probably served originally as a flood defence), the mock-timbered gables, jettied-out first floor and the ‘oriel’ type projecting windows. The style of the old shop itself had echoed the Manor House which had recently been updated with a mock-timbered Jacobean facade with similar features. This shop, plus another one adjacent, was ‘newly built’ by the Duke of Buccleuch 1882, the date of the first leases. They replaced the ancient White Hart on the corner (see Corden painting above) which had belonged to the Lord of the Manor and by this time was being run by the same licensee as the much smarter Manor Hotel opposite. The White Hart is recorded as an inn from about 1730 but can be traced as a house called Piper’s back to the 1560s in the court rolls of the Manor.